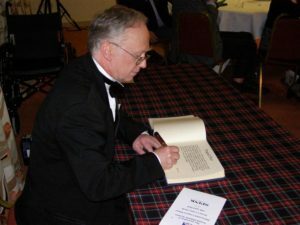 Douglas N. Muir is the Senior Curator of Philately at The Postal Museum in London, formerly the British Postal Museum & Archive and a signatory to the Book of Scottish Philatelists and the Roll of Distinguished Philatelists. Muir was born in Balfron and subsequently attended Glasgow University where he studied geography and archaeology. His first job was as a language teacher in Pforzheim in Germany. He worked as a philatelic journalist and Editor on Stamp Collecting, the Philatelic Magazine and then the British Philatelic Bulletin. He was also the founder of the Postal Mechanisation Study Circle. My name is Matthew May. I am Douglas Muir’s second cousin. His mother Winnifred Muir (nee Miles) was my father’s cousin. I have been searching for Douglas for several years. Back in 1979 I had a brief telephone conversation with Winnifred, but lost contact thereafter. Any information would be much appreciated, especially if Douglas could contact me. There is no urgency, I am just a family historian, with a ‘gap’.